The side effect of this is that now I do have a use for a Dramiel. Warping through high sec to an event like this would be a nice little niche role for the ship. I hated being in a 'shoot me please' ship lick a blockade runner. I was late getting into Sarum Prime. I had expected them to land on the gate but they didn't land. That confused me. I'm new to the live event thing so I missed the start. It then took me forever to realize where they were. But I caught up. 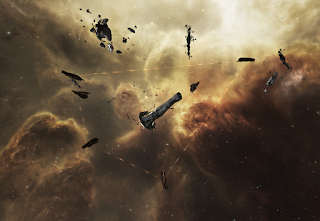 [20:01:59] Jamyl Sarum I > The presence of so many of our finest loyalists here is a sight to behold. A sight that fills the hearts and minds of the people of the Lord’s domain with hope. [20:03:16] Jamyl Sarum I > Together, we will face this threat as a solid wall. Unwavering. Unswaying. Resolute. Immovable and unshakable. Through our defense of our hallowed ground this threat will find no breach. She then screamed "Amarr Victor" and people spammed it cheering off my screen. [20:06:27] Jamyl Sarum I > Under whose authority do you operate? [20:13:37] Jamyl Sarum I > Mentor Raish, you leave me no choice. So then one of the dudes goes flashy yellow and everyone attacked them. I guess you don't scan the empress. [20:16:06] Akami Mieyli > We dealt with him, Empress. [20:17:27] Jamyl Sarum I > Commander Vamai - Do you have full transcript and readout of comms from Mentor Raish? [20:18:28] Renegade Heart > to all those who are disloyal to the empress we'll be comiung for you next! [20:18:49] Peviad Vamai > Yes, my Empress, all relayed communications have been sent to Throne Worlds Fleet HQ for analysis. 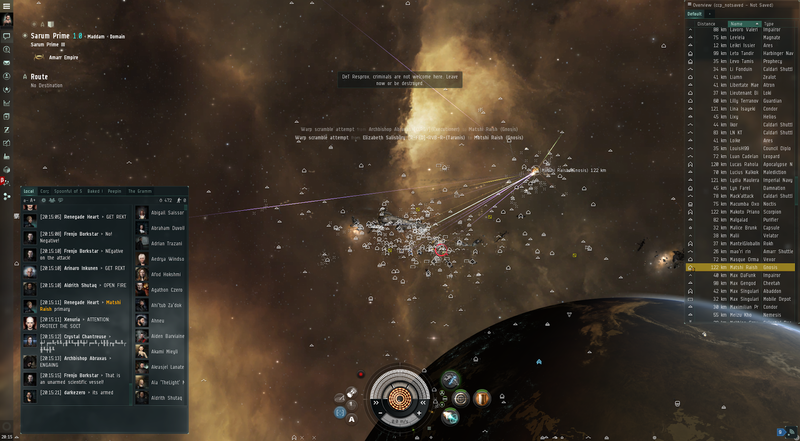 [20:18:55] Jamyl Sarum I > Very well - Report to Grand Admiral Sundara on return to Safizon for full debriefing. [20:19:11] Peviad Vamai > By your will. [20:19:13] Jamyl Sarum I > I'd like to know his intentions. [20:19:52] Gavriel M'el > Empress Jamyl Sarum I was merciful to allow him so many warnings... justice was served by his own choices. [20:23:12] Max Singularity > Jamyl Sarum I Was he under arrrest? Was he being detainted my web and scram? What justice is this? 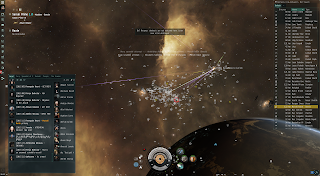 [20:25:49] Max Singularity > Jamyl Sarum I There was no diplomacy. This is rogue justice. There are questions to answer? She left with no answer to Max. Interesting. Ah Max, how fascinatingly bad at RP you continue to be. Welcome to the 21st Century Amarr Empire, with 'arrests', 'detaining' and 'justice'. Newsflash, pal, there is no Justice but God's justice, and the representative of God is the Empress. Disobey the Empress, and face the consequences. I guess, however, that it would suit him for there to be theological wiggle room in the Amarr Empire. Sadly, Feudal Religious Theocracies do not work thus. I just felt I should add that CCP's doing a sterling job in these new 'RPathons'. Their smacktalk is highly entertaining, and their RP abilities are an example to us all. More please! 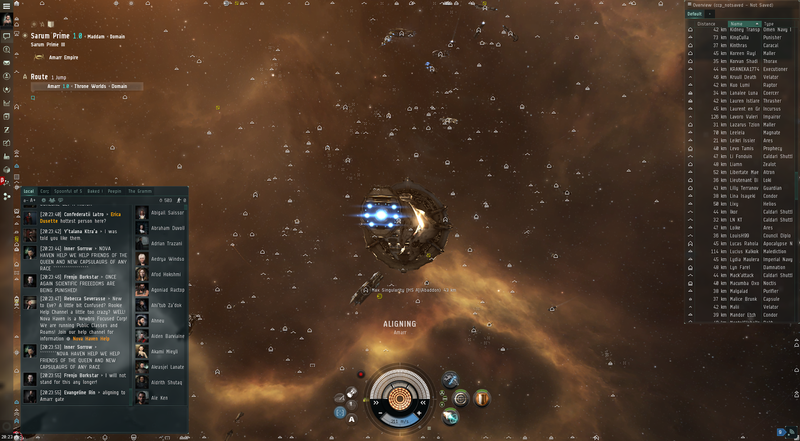 If CCP were willing to set up some Gallente events, It would warm my freedom (dictatorship) loving heart! This brings up an interesting point though. For an agreement so central to EvE, I don't believe we've ever even seen the Yulai Convention in full. What is this mysterious 'Ninth Codicil'? I suspect an 'end of the world' clause, or perhaps a 'Amarr Empire done fucked up and stuck in a anti cloning amendment' clause. I know that Wardecs are ended/started under the Convention, and I believe there's a cloning section also. 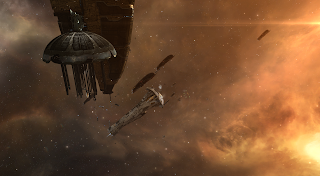 Perhaps CCP would consent to delivering us this (unwritten?) document. More Fluff = More Worldbuilding = Better RP! I don't actually want the document. But a cliff notes version would be fun. They could embargo parts of the treaty under state secrets to leave wiggle room for possible later expansion. More of a, "This is what we know about it now. ".